At ANY LAB TEST NOW®, we are specialist in Drug Testing and we offer several affordable, convenient and anonymously testing. All drug screens are performed by qualified DOT collectors and sent to a SAMHSA certified laboratory. 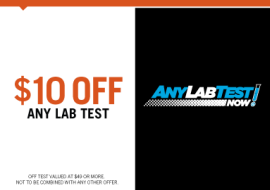 ANY LAB TEST NOW® performs multiple drug tests using urine, blood, nails or hair. We provide testing to identify suspicious substances like pills or powder. Avoid the long wait in the office! At ANY LAB TEST NOW, we guarantee facility courteous, respectful experience. You will be in and out in 15 minutes with quick turnaround of your results. All of our tests are 100% confidential. No doctor referrals needed. No unwanted questions. Just the tests you need when you need it.